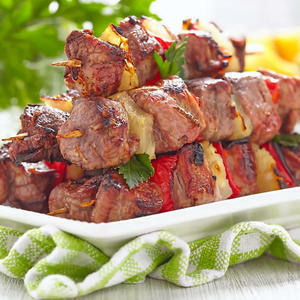 Tender, juick pork tenderloin, grilled on skewers with fresh pineapple and bell peppers! Marinate the pork cubes overnight if you can, the flavor is outstanding! How can it not be, pineapple juice, brown sugar, soy, sesame oil and garlic! These babies are outrageous and so easy to put together!